Welcome to the summer fiction issue. Teresa Milbrodt returns with another story about dislocation: a woman struggles with diminished eyesight; her partner suffers indignities as a parking lot attendant. This is her sixth story in NAR. Congratulations! Aimee Parkison makes her first appearance in our pages with a haunting, fractured story about abduction, murder, and loss. “Three Fish” by R. G. Rolland explores the intersection between artistic potential and desire. The stunning art for this piece is from newcomer Matt Manley and captures the story's discord. 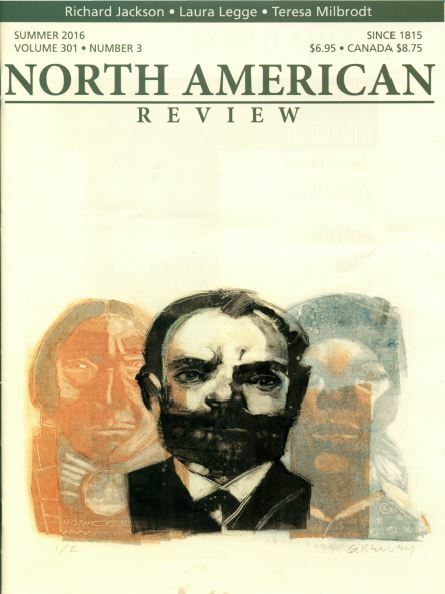 This issue also recognizes Hispanic Heritage Month with a nonfiction piece by Christopher Gonzales, a poem by José Angel Araguz, a review of Martín Espada’s Vivas to Those Who Have Failed by Edward Carvalho, and artwork by Vlad Alvarez. With this issue we say goodbye to our eight-year nonfiction editor, Kim Groninga. Under her editorship, several nonfiction pieces landed in Best American Essays. Kim shares some parting thoughts, “What I will cher-ish more about my time at NAR is all the gorgeous pieces of writing I was lucky to read and share. Hundreds of startling ideas, new images, and strings of perfect prose now live in my memory just waiting to be re-called.” Kim’s keen eye and caring heart will be missed in the office. We would like to welcome our new nonfiction editor, Brooke Wonders to NAR. Brooke debuted in our pages two years ago with “Skinwalk: A Dissection.” She is an accomplished writer of fiction and creative nonfici-ton. Her work has appeared in DIAGRAM, Clarkesworld, Brevity, and The Collagist. We look forward to her contributions to the magazine. Enjoy!